I headed down to Durdle Door this evening with one shot in mind, a really long exposure with the new Lee Filters Big Stopper! I have had the filter for a week now but haven’t had the conditions or light to give it a proper test, so I was slightly disappointed with the sea fog that was floating around when I arrived at one of Dorset’s most popular and iconic locations. That didn’t stop me though and the shot that you see is the result of a lengthy 743 second exposure (just over 12 minutes). I must mention and say hello to my company for the shoot, two fellow photographers from Chichester, who had travelled down to shoot the sunset, it was nice to have the company whilst kicking my heels during the long exposure. Our evening wasn’t without some excitement either, it was all hands to the camera kit when we were suddenly caught by an almighty wave that quite literally swept our bags and their camping stove away…..I hope your gear dries out okay. ~ by David Baker on 16 March, 2010. Stuart, flattery will get you everywhere! Home and dry ish!, tripods took the brunt of the water and the bag will take a day or 2 to dry out 5 hours driving and not a decent shot to post! its not the first time and i doubt it will be the last at least you got something worthy of looking at. The poor light doesn’t make the climb back to the cark park any easier does it. Good to see the final result from the Big Stopper. Love the pastel shades in the sky and water. I came across your website after reading about the Lee Big Stopper. I have just acquired mine, and can’t wait to use it properly as I am keen to improve my landscape photography. 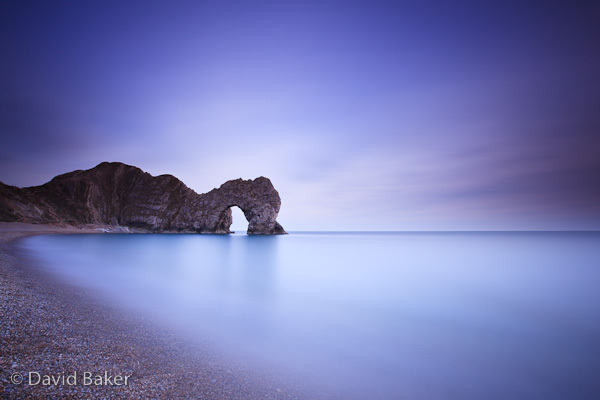 I must say the images on your site are an inspiration, and I might even take the long trip down to Dorset to visit a few locations your regularly photograph. Its a great filter that has many uses, where better to test than Dorset.